This superbly located independent chalet is ideal for a family or friends as it is south facing and has fabulous views over the ski slopes and the mountains and it is so close to the main ski run that you can practically ski from the chalet and back. It is an easy walk to the centre of the resort as well as good choice of character restaurants in the middle of the slope and ski school. 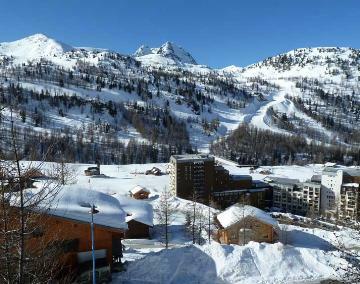 Chalet accommodation covering 75 m² on three floors, 2 bedrooms and a gallery, 2 bath/shower rooms, satellite television. The ground floor has a living and dining room with television and a fully-equipped open plan kitchen (with oven, electric hob, microwave, dishwasher etc. ), opening onto the good sized balcony where you can relax and enjoy the sun and the views. On a gallery overlooking the sitting room, there is a double bed. The upper floor has a master double bedroom with television and a twin bedroom (2 x 90 cm wide beds). Bathroom with toilet and a shower room with walk-in shower and toilet. Ski slope 30 metres. Ski lift 200 metres. Ski school and resort centre 300 metres. Nice airport 84 km (there is a bus service). Note: the deposit at the time of booking is 30% of the chalet rental. Property made available in good order and fully equipped. Linen and towels provided, beds made on arrival. Reasonable consumption of services including water, gas and electricity. Refundable deposit payable locally 750€. End of stay clean payable locally 144€. Firewood 30€ per week. Tourist tax 0.95€ per person per day for adults and 0.8€ for children (13 - 18 yrs) - guide price. Cot 29€ per week. High chair 15€ per week.